Shelley chocolate, you ask? What could that be? 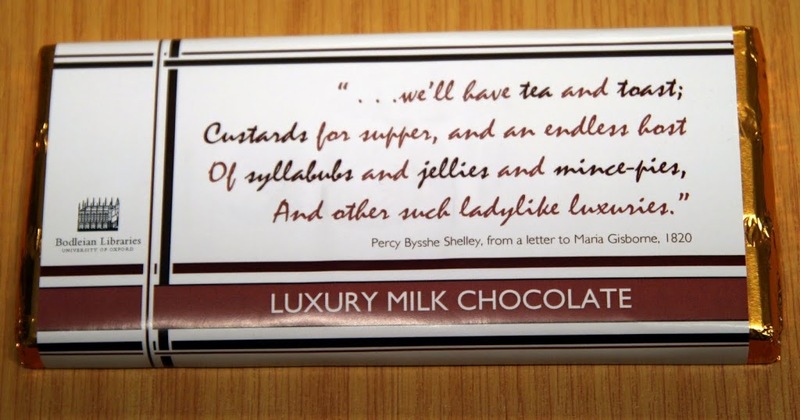 The Shelley chocolate bars are produced by Farrah’s of Harrogate for the Bodleian exhibition. 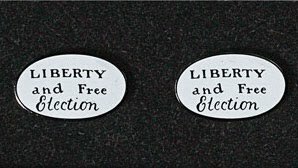 Chocolate isn’t the only choice, however; we are also offering ‘Liberty and Free Election’ and Frankenstein merchandise, ranging from cufflinks to bags. All items are available through the Bodleian Shop. If you’re interested in learning more about Shelley and the exhibition itself, the book Shelley’s Ghost: Reshaping the Image of a Literary Family is available for purchase on the exhibition website. Written by Stephen Hebron and Elizabeth C. Denlinger, the book explores the lives and reputations of Percy Bysshe Shelley, his wife Mary Shelley, and Mary’s parents, William Godwin and Mary Wollstonecraft. Mary Shelley, haunted by the past, directly sought to enhance the public’s appreciation of her husband and parents by the selective publication of relevant manuscripts; she passed along her legacy to her son and his wife. As guardian of the archive until giving part of it to the Bodleian in 1893-4, Lady Shelley too helped shape the posthumous reputations of these important writers. 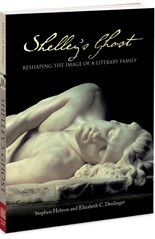 The book uses the Bodleian’s collections – from manuscripts to cherished objects – to illustrate the Shelley family history. In a final chapter, Elizabeth C. Denlinger of the New York Public Library looks at the material that the family was unable to control. This entry was posted in exhibition, merchandise, shelley's ghost on 2 December 2010 by .